Police in Bristol made nine arrests ahead of the second televised debate between the three main party leaders. The arrests - all for public order offences - were made as several hundred protesters from different interest groups converged on the city centre. The debate was held at the Arnolfini arts centre in the docks. Mounted police and dogs were deployed to the strip of land between Pero's Bridge and the gallery in an attempt to keep the groups apart. 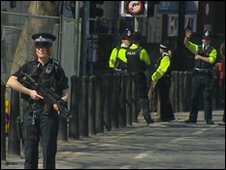 A huge security operation was mounted in Bristol because of the debate.